Carton packaging and filling machines provider, SIG Combibloc has launched new Combidome carton bottle for low-acid products such as milk and plant-based dairy alternatives. The new Combidome bottle has been selected by US-based Steuben Foods to launch its nut-based low-acid beverages in almond, hazelnut, walnut and cashew varieties. SIG Combibloc key account manager Christian Szameit: “With the launch of the Elmhurst nut beverages, the package is being used for low-acid products for the first time. 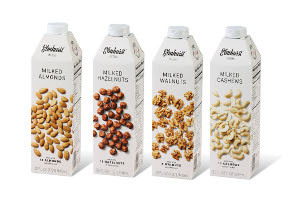 Steuben Foods, which sells premium nut-based beverages under the brand name ‘Elmhurst’, will showcase the products for the first time at the Natural Products Expo West scheduled to be held in California in March. Steuben Foods business development senior vice-president Jeff Sokal said: "With our new milked nut beverages we’re presenting products that are unique in this segment. SIG Combibloc aseptic technology head Hanno Geissler said that packs must meet the highest requirements for sterile use for the UHT filling of low-acid products. SIG Combibloc said that the combidome Low Acid machine has an FDA Master File, providing customers with all the necessary data, information and supporting documents required by the FDA in connection with our filling machines. Steuben currently operates SIG’s CFA 812 filling machine to fill combiblocMidi und combifitMidi as well as CFA 312 for combiblocSlimline and a CFA 1224 for combiblocXSlim. Image: Steuben’s new product range in Combidome carton bottles. Photo: courtesy of SIG Combibloc.